Bulleit Bourbon ($20) or Bulleit 10 Year Bourbon ($35) – The 10 Year is a new offering from Bulleit that was introduced in 2013 and I haven’t read any favorable reviews or received any favorable recommendations on it. I had tasted their regular Bourbon almost 2 years ago and wasn’t impressed. I approached the judging by expecting the flavor of the 10 year to reflect it’s age, but I was duped. The 10 Year is worse than the original and a definite waste of money. Crown Royal ($18) or Crown Royal XO ($45) – I’ve not had many Canadian whiskeys, so this was new for me. The cognac influence of the XO was subdued (as was the general flavor of both whiskies), but discernable. I didn’t find either one very interesting, so I would pass on both of these. Bushmills Black Bush ($30) of Bushmills 1608 400th Anniversary ($100) – This was the most difficult to identify because both of these blends have sherry influence. 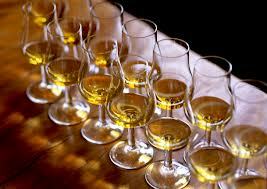 Black Bush is finished in sherry casks, while 1608 includes whiskies which have been aged in sherry casks. For me, the 1608 had an added depth of flavor and richness that caught my attention more. Both of these were good, but I prefer Jameson 12 Year ($39) or Jameson Gold Reserve ($63) over either of them. MacAllan 10 Year Fine Oak ($38) or MacAllan 17 Year Fine Oak ($150) – This was probably the easiest to identify even though both of these are good. I had tasted both of them at a previous Trinity Hall event and this helped as well. The 17 Year just had enhanced flavors and complexity over the 10 Year, but it’s still not worth the price difference. If you’re keeping track, then you know that I correctly identified 3 out of 4. I don’t know of anyone at the event who correctly identified them all (like I said, Bulleit duped everyone with their 10 Year Bourbon by making it worse than their original). This was a good test of whether premium offerings really offer anything special and it was a fun event to attend. In general, premium offerings need to be approached carefully. There are those who will offer inferior products with a premium label (e.g. Bulleit), while others will price their premium offering far too high to make them worthwhile (e.g. MacAllan). Still others, take mediocre products and enhance them to create mediocre premium products (e.g. Crown Royal). What you’re looking for is the honest producer who will masterfully or cleverly work to create a superior product that is worthwhile. The closest example of that tonight was Bushmills 1608… even though it’s not a whiskey that I would seek, the premium blend definitely demonstrated a richness, depth and complexity that I expect in a premium offering. Posted in Whiskey. Tagged Bourbon, Bulleit, Bushmills, Canadian, Crown Royal, Irish, Single Malt, The MacAllan. The standout values for the night were the Fine Oak 10 and Sherry Oak 12, which were both good. I would give a slight nod to the Sherry Oak 12, which had a more interesting flavor profile due to the sherry influence. The standout of the night was the Sherry Oak 18, which I consider a very nice whisky, but overpriced. Everything after that was severely overpriced, in my opinion. The Fine Oak 21 was interesting, but not dramatically more so than the Fine Oak 17 and the Sherry Oak 25 was a disappointment when compared to the Sherry Oak 18, especially at more than 4 times the price! I’m really glad that I was able to attend this event and get this experience at a price that would’ve matched that of a single pour of the Sherry Oak 25. This helped solidify my previously unfounded belief that The MacAllan makes very good whisky at outrageous prices, while offering the masses some solid values at the same time. Even in the lower price range, you can find better offerings, but you can always return to these for a reliably good and solid whisky. If you’re interested in trying their best, then it might be worth it to spring for the Sherry Oak 18 before it disappears from shelves as The MacAllan introduces an entirely new range next year. I don’t expect much change with the new line that would dissuade me from the evaluation that I came away with last tonight. I might even try some of their new entry-level whisky when they’re available. Posted in Whiskey. Tagged Highland, Single Malt, The MacAllan. 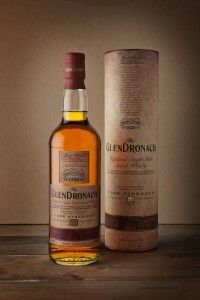 The only affordable offering is the MacAllan, but I may spring for the Glenfarclas 105 at some point as well. Posted in Whiskey. Tagged Glenfarclas, Glenkinchie, Lowland, Master of Malt, Single Malt, Speyside, The MacAllan. The nose is lightly peated toffee, grass, orange and ginger. The grass is feint and the ginger arrives last. After being allowed to breath, a mild smoke aroma appears. This is one of the easiest to pick out distinct aromas so far… very nice. The taste is immediately and consistently a balance of sweetness, bitterness and spice. Orange and ginger with apple and vanilla with mild oak and just a bit of peat. There’s also bitter honey and white pepper. The aftertaste is long wit the spicy pepper lingering long after the sweetness dissipates. In the end, there is only a mild oak, but without the leathery feel. Anyone looking for a heavy wood influence will be left unsatisfied. For me, this is a nice young Scotch whisky and only the second MacAllan I’ve had… both 10 year old and this is the better of the two. 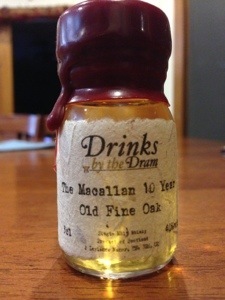 This 10 year old from Macallan was matured in a mix of bourbon and sherry casks. Posted in Whiskey. Tagged Single Malt, Speyside, The MacAllan.